Members of a 160-strong Chinese army medical team attend the opening of a $41 million Chinese-backed treatment center for the deadly ebola virus in Monrovia, Liberia, November 25, 2014. Over the past five years, the Chinese military presence in Africa has undergone a profound change. Until 2012, the Chinese were happy to play a low-key support role in multinational peacekeeping operations on the continent, preferring to send military engineers and medical staff rather than deploy combat forces. Today, that is no longer the case. 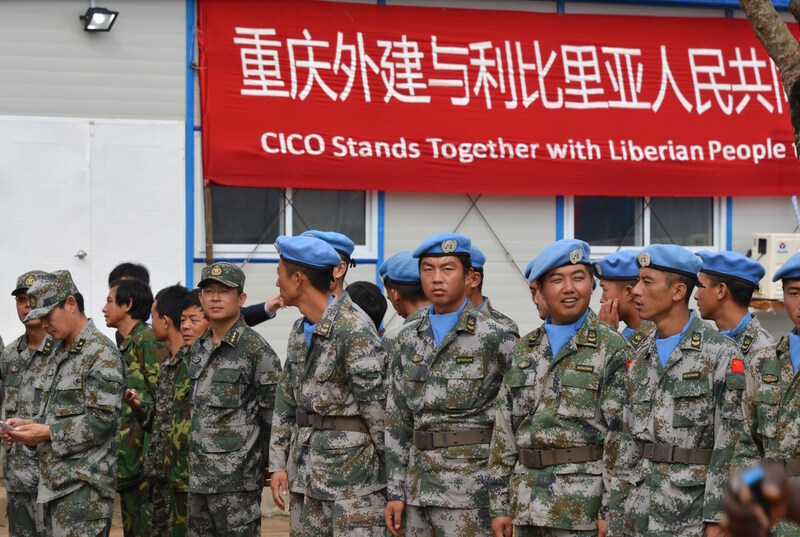 China is the eighth-largest supplier of troops for U.N. peacekeeping operations in Africa and is the largest among the five permanent Security Council members, according to the European Council on Foreign Relations. The large and growing Chinese military presence in Africa is also becoming increasingly diverse, both in terms of where its forces are deployed and their operational capacity. China’s most sophisticated warships have been actively involved in anti-piracy operations since 2008 off the coast of Somalia in the Gulf of Aden. In West Africa, the People’s Liberation Army (P.L.A.) deployed elite medical units, including a massive hospital ship, to Ebola-ravaged regions in Liberia and Sierra Leone and, similarly, Chinese military medical teams have also been dispatched to the eastern D.R.C. where they provide desperately needed healthcare to the embattled civilian population. Around 2014, the Chinese began to shift their military engagement strategy in Africa to include the deployment of combat-ready infantry units to countries like Mali and South Sudan, where the United Nations is being actively targeted by Islamist radicals and partisan fighters. Although three Chinese soldiers have been killed this year in Africa, experts note these P.L.A. combat forces are typically confined to their bases and rarely venture outside the wire. Nonetheless, the fact that the Chinese have taken that first step in redefining their role in African security operations is significant, and with the imminent completion of the P.L.A. Navy’s new outpost in Djibouti, it seems likely that this trend will continue in the coming years. Mathieu Duchâtel, Richard Gowan, and Manuel Lafont Rapnouil recently explored China’s new military engagement strategy in Africa in a policy brief for the European Council on Foreign Relations. The trio raised the interesting question of how a more robust Chinese security presence in Africa will impact European military operations on the continent given that countries such as France and Britain, among others, have long considered Africa to be a traditional sphere of influence. Mathieu and Manuel join Eric and Cobus to discuss the rapidly changing multinational security architecture in Africa.